I've moved to the Sudan... and I'm sitting under a fan in Khartoum writing this... I've now been here a couple of weeks and am no longer totally lost. I've a new job as the UN Environment Programme (UNEP) Representative for Sudan. We hail from UNEP's Post-Conflict and Disaster Management Branch, which addresses the links between environment (or more specifically, 'natural resources') and conflict. The Sudan programme has had a fantastic start through a two-year project to create a Post-Conflict Environmental Assessment for Sudan, which was published this year and is one of the best surveys of the challenges of a developing country environment you will find anywhere - a tribute to the energy and drive of Andrew Morton, who led the effort. The assessment develops some 85 recommendations, and our job here is to make as much of that happen as we can. The 'post' in 'post-conflict' refers to the end of the long-running North-South civil war and the signing of a Comprehensive Peace Agreement in 2005. Darfur is another matter and is now moving towards banditry and lawlessness. I recommend Alex DeWaal's blog: Making Sense of Darfur, for insights into that tragedy and the intricate politics behind it. But when it comes to providing root solutions to the country's problems, it begins with a core issue facing so many people in Sudan and elsewhere in this region. You all know that the conflict in Darfur began, long ago, in part because of drought. When the rains failed, farmers and herders fell into competition for an increasingly scarce resource. The decisions of man to wage war over these precious natural resources further compounded other factors and challenges. But the fact remains. Lack of water, and a scarcity of resources in general, has contributed to a steady worsening of Sudan's troubles. As part of the solution, the Government with international assistance will have to ensure that the people of Darfur have access to vital natural resources – water being chief among them. The UN stands ready to assist in this effort. The link between natural resources and conflict is probably felt most strongly through the pressures on and opportunities for viable livelihoods. For the poorest in rural areas, their assets and 'wealth' are environmental (or in the case of livestock, dependent on the environment). One of the best expositions of this idea is the 2005 report of World Resources Institute, The Wealth of the Poor. For Sudan and Darfur, brilliant work on livelihoods has been done by researchers from Tufts University Feinstein International Center, see Livelihoods Under Seige (2005), Sharpening the startegic focus of livelihoods programming in the Darfur region (2007): report of workshops held in Darfur, and Strategies for economic recovery and peace in Darfur (2007). These provide great insights into the ways out of the Darfur conflicts - to the extent that you can be optimistic at all about Darfur, it is through thinking about how livelihoods might develop or re-establish. Darfur Integrated Water Resources Management - how much water can be abstracted and how should scarce water resources be managed and shared between competing uses and users - and what is the right model of governance? 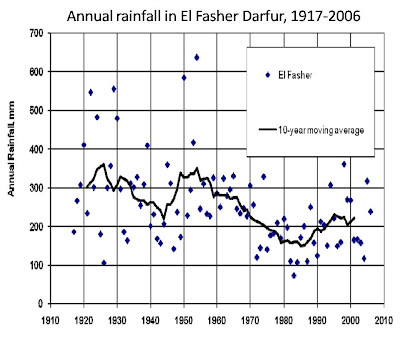 Darfur aid and environment - how can the massive international operation (the UN, donor nations and NGOs) in Darfur operate coherently within environmental and natural resource constraints? Capacity building - for the Government of National Unity and Government of Southern Sudan. Mainstreaming - how do we deliver on the recommendations of UNEP's environmental assessment? An almost unlimited opportunity to improve the lot of people all over Sudan. It will be very challenging but the one thing I've understood since being here is that most people involved 'get it' at a fundamental level, and mainly need to work out what needs to be done and how to do it. There certainly no shortage of commitment from high levels in the UN, willingness from donors and a lot of enthusiasm amongst the government officials and Sudanese people I have so far met. I'm not sure I'll have much opportunity for blogging - I'm in a diplomatic job, and that means being, er, diplomatic. But I hope to post occasionally on interesting policy issues in Sudan and to keep an eye on the international environmental agenda, mainly from a technocratic rather than political perspective. I won't be doing a travelogue, personal diary or expressing wonder at the new experiences I am bound to have - I'll spare you that! Have fun Clive. Stay well and remember Jan Pronk. Yes indeed. Good luck. I will be reading with great interest. Hello! I am your blog’s new visitor from Eastern Asia. You’ve got a nice blog here.